COLLECTIVELY speaking, we tend to live for moments in spaces; small chunks of life wherein we experience an environment that leaves an impression. If you’re paying attention, it may bite with some frequency, actually. A stirring space makes you feel. It inspires you to think, reflect, and act. Temples, cathedrals, and synagogues are obvious cases in point. They do it well. Our ‘holy places’, however, tend to run on the casual side of the spiritual mainline. As fixed believers that ‘space shapes life’, we’re ever aware of the spaces we enter and the affect they have, be it on us or those that live inside. Dee Wilson’s home is the proof, the pudding, and the eating. Having taken a tour, we’re aptly changed. Motivations made absolute, we’re inspired to design better, live deliberately, pay attention, and love space literally. An embellished or idealized sentiment? No. It’s impossible to note every deliberate and keen detail of the space – there are simply too many. 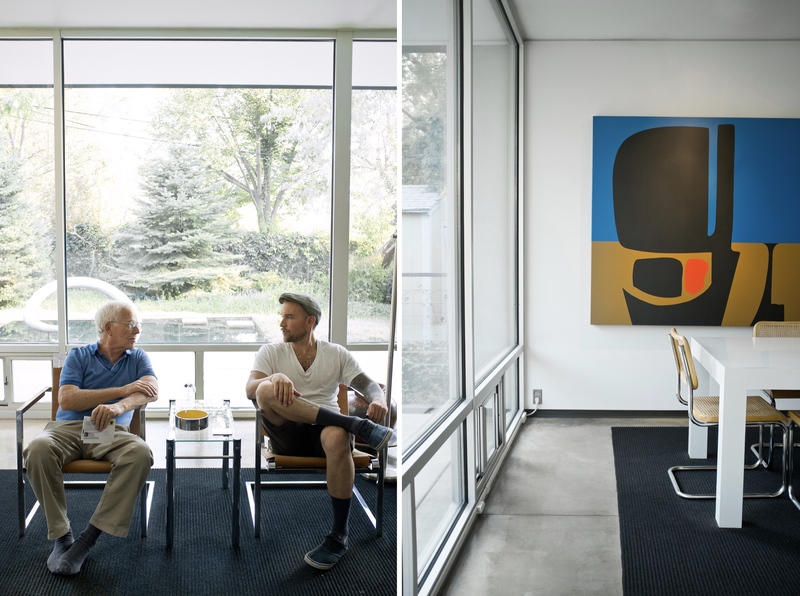 Salt-Lake-City dweller, Dee Wilson, is a local architect who has perfected the art of simplicity. The final project before retirement, his personal residence exemplifies the crescendo of his collected works in modernist progression. 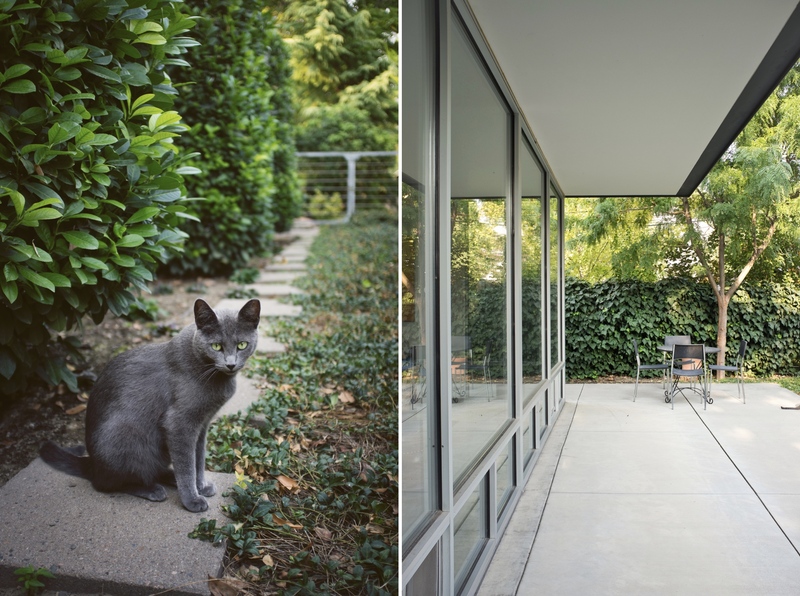 He’s remained faithful to his home’s style, evidenced in part by his decision to integrate the structure seamlessly with nature; the home is positioned between two Catalpa trees in an effort to save them. 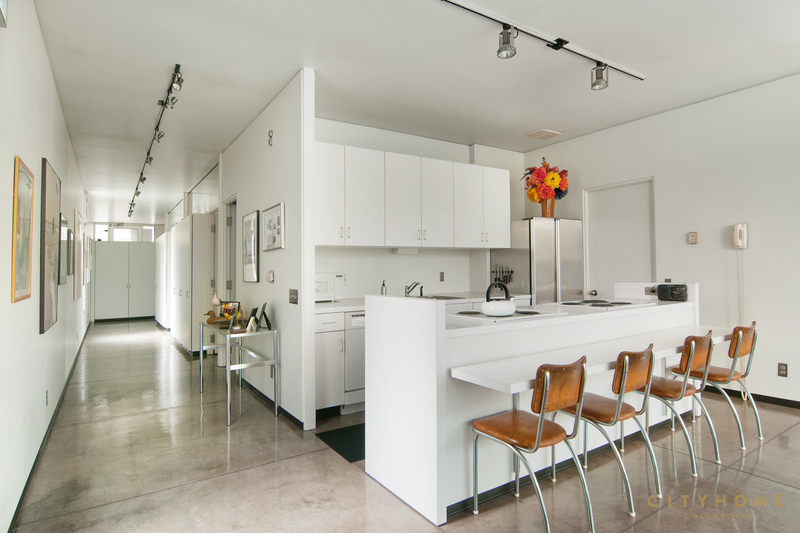 As a result, the impact was minimal and modern, understated yet bold. Dee’s home is a wallflower on the street, its pretty face pulled back among the more noticeable bungalows and Victorians. 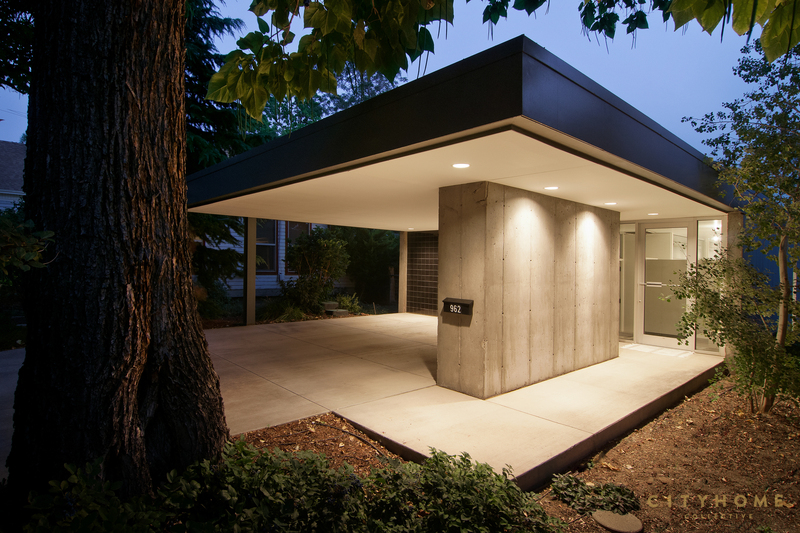 A simple car port is the mug of the casa, and in winning a spark of inspiration, black tile was used on the street-facing wall, making for an exotic entrance that, when lit at night, is stunning. There’s a perfectly-placed, concrete pillar that visually separates the car port from the front door, and (in a stroke of quiet genius) its secondary function is that of a secret storage space. 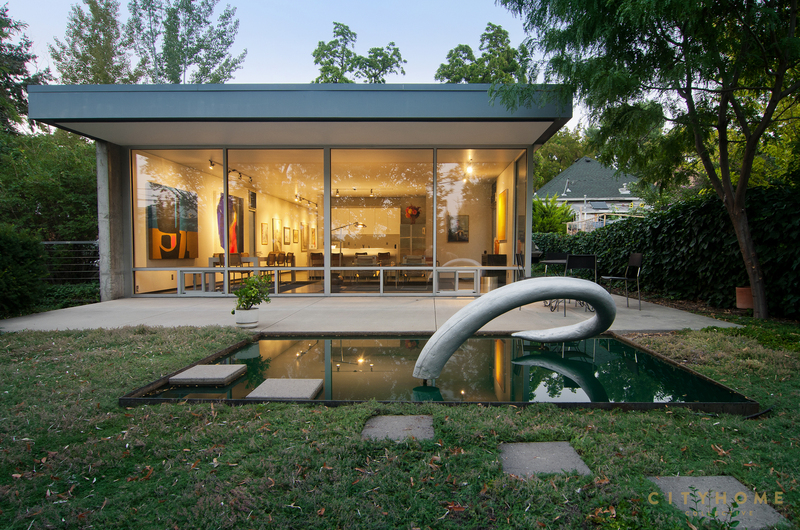 The glass entry way to this incredible space serves as a literal window of proof that the concrete flows seamlessly from exterior to interior. It’s a modest single-level at 1,800 sq. ft., but given the notably designed floor plan, official size is of little concern. 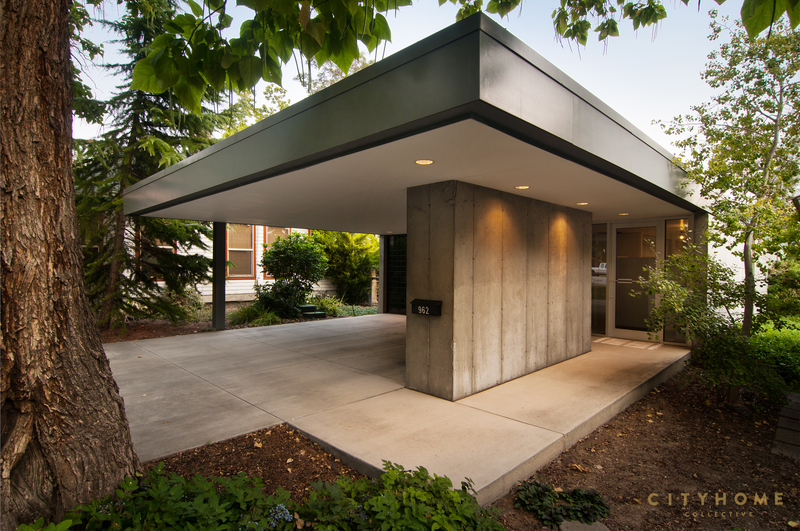 Steel beam and metal suspension at play, the home is positioned between two concrete walls that travel smoothly from the car port to the rear garden. A creative application of linear living has been put to use and the entry hallway is a lesson in flow. Living quarters in the form of office, bathrooms, and master/guest bedrooms coyly line the left wall behind a savvy collection of built-in [and out-of-the-way] storage units. 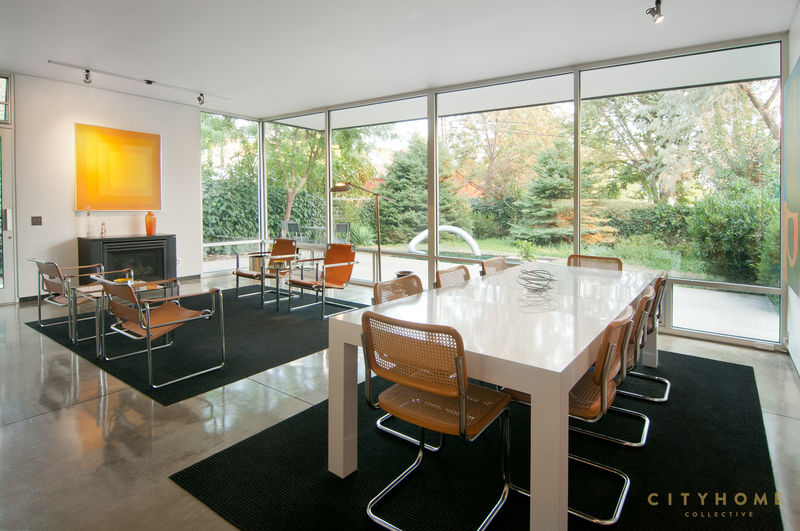 Equal to the task of forward movement, a gallery of work covers the right wall clear to the rear of the house. 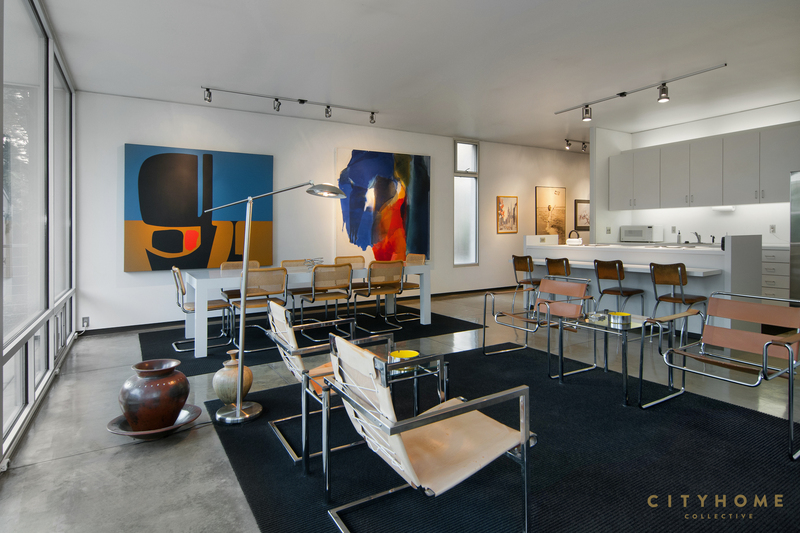 The ceiling height throughout feels ideal at 9’4″, and concrete floors, complete with radiant heat, flaunt gorgeously up-to-date living standards. Once you approach the entertaining space, the house basically blooms in full. An arresting wall of double-pain windows opens up the interior space and pulls in the courtyard, allowing for an intimate connection with the Salt Lake seasons. It’s a stellar example of living inside without feeling enclosed.